In her recent opinion column, Senator Lynne Woolridge provides an overview of the delineation of responsibilities between Ministers and the public services in an attempt to remove accountability from Ministers. The Senator described what should be, however, the Senator has failed to state what is actually practiced. There are cases in which Ministers are bypassing the Permanent Secretaries and are giving instruction directly to Department Heads and public service employees. This is clearly a violation of both Cabinet and Ministerial responsibilities and procedure. It is this practice that places public service employees in a very compromising position and it needs to be stopped immediately. One wonders if the Ministers themselves understand that they should not be giving directives. The role of the Civil Service is to be apolitical and serve the Government. As such, there must be a clear delineation of how to promote and maintain ethical standards of conduct between Ministers and Civil Servants irrespective of the Government of the day. Whilst currently there is intense focus being placed on the productivity and accountability of the Civil Service, Ministers and all political representatives must also be answerable for their actions. In order for there to be an effective government, it is essential that Ministers and public servants work hand-in-hand to achieve the Government objectives and maintain quality service delivery. When objectives are completed and goals are accomplished, both Minister and public servants should be applauded. However, one must question why Senator Woolridge appears willing to lay blame exclusively on public service employees when expectations are not met. This is a slippery slope the Senator is traversing. The Auditor General’s Report on the Consolidated Fund highlights concerns surrounding maladministration, ministerial interference and other forms of mismanagement. If the position of the Senator holds true, this would mean that both the previous and current Government can remove themselves from all accountability for financial irregularities and lack of compliance to financial instructions. While Ministers themselves have no authority to make any financial transactions, this does not excuse them of the responsibility. Ministers must accept accountability for the exercise of their powers and the functions of their office. In this piece, Senator Woolridge also states, “….the public service is an organization with its own boss – the Secretary to the Cabinet. It is an organization responsible for choosing and hiring, promoting and disciplining its own members, working to and oversight body called the Public Service Commission. The Commission is made up of citizens appointed by the Governor. Ministers cannot interfere with their process”. It is clear that the boundaries which Senator Woolridge speaks of have been crossed in this case. 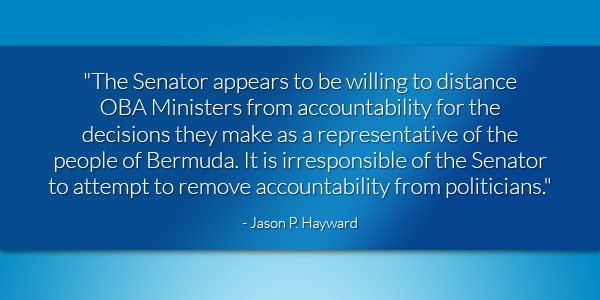 The Senator appears to be willing to distance OBA Ministers from accountability for the decisions they make as a representative of the people of Bermuda. It is irresponsible of the Senator to attempt to remove accountability from politicians. No comment on the Auditor’s report then? It details the absolute lack of any accountability when the PLP were in power. I wonder how the spending practices of various Bermuda unions stands up to his opinion piece. Or an audit. Well….they spent big on his raise. Does that tell you anything?? That was History, just like slavery lets talk about the here and now. Pump ya breaks. Did you just say let’s put slavery behind us? Weren’t you the other day talking about compensation? How come you only ever refer to the Atlantic slave trade and none of the others? Are they not equally injust to you? No I said that was History which it is, but the ills of it are still effecting us today, namely most white people are benefitting economically, socially and psychologically today. And what other slavery are you are referring too. Where the slaves you refer too stolen from their Homeland, of their language, identity and culture, murdered, raped, treated worst then cattle, worked free for centuries while their owners profited for generations, and their descendants systematically located in segregated neighborhoods, discrimination, denied jobs to sustain their families, not allowed to vote, and STILL are paid less then their suppressor’s descendants counterparts, systematically profiled by the LAW to feed the growing industry of school to prison pipeline, etc, etc !!!!!!!!!!!!!!!!!!!!!!!!!!!!!!!!!!!!!!!!!!!!!!!!!!!!!!!!!!! I’m waiting to hear who these other groups of slaves were. I guess that is not good enough for you though. Wasn’t the hiring freeze agreed to by the BTUC as a means to stave off furlough days? So exactly how have boundaries been crossed? And what does the BPSU have to say about the recent AG report where it was reported that civil servants were signing checks without cabinet approval? Seems to me civil servants crossed boundaries when spending the people s monies. Will the BPSU defend such malfeasance from their members or will they be held accountable like they would in the real world? Is Mr. Hayward then ready to come out and say that the Hon. Paula Cox as minister of Finance is in fact responsible for the missing 800 million dollars? or is Mr. Hayward a hypocrite? Don’t forget Burt was also Junior Finance minister !!!!! So we can expect to see a scathing attack from Hayward on Burt. We are waiting…………………………………..
What Mr. Hayward is saying is that if the OBA says that its ministers are not responsible for failings then how can the PLP ministers be held responsible for failings. I agree that Lynn’s piece was a cop out. Craig Cannonier has to step up and take responsibility. However, Craig is either a coward or he really has no power when it comes to dealing with the unions. Can you help, Mr Hayward? Which is it? Yes. I wasn’t a big fan of the senator’s column and I think the party should have just left it alone. The AG report should be front and centre. Keep it there. And get the airport done. I agree wholeheartedly. So can we now expect Mr Hayward to be leading the calls for the Government Leaders and Ministers of the PLP tenure in power to step up and take responsibility for the state they left Govt finances in? Will they step up and accept responsibility for the mismanagement of the public purse and the seeming lack of accountability they allowed in the Civil Service, as detailed in the most recent Auditor General’s report? Everyone wants to go to heaven no one wants to die. No one. This is all political fodder. Go after those involved with every qualified audit. Agreed? I think that the Senator’s attempt to help Ministers avoid accountability for their Ministry’s actions was indeed a cop out. However I must state that I believe that the root of many of the problems within Ministries got worse when the former government decided to make Ministers Full time. With nowhere else to go and nothing else to do they began to get more directly involved in the day to day operations of their ministries, something they are not supposed to do. There was no outcry from the BPSU about this and this behavior continues with the present government. Additionally there was a lack of good leadership in the Civil Service and Civil servants who may not have agreed with what a Minister was directing them to do did not have any trust that they would be properly supported if they challenged a Ministers instructions. What is needed now is a clear and proper separation of the Civil Service and the Politicians which highlights their respective roles and responsibilities. This needs to come from government House as they are supposed to make sure that the system of governance works. blah, blah, blah, blah, blah, blah……. Seems like they are all lining up this week? But of course that would be on the lines of a Conspiracy Theory into the PLP, Unions and PC being one of the same. Laughable criticism considering the lack of accountability with the unions themselves. Mr. Hayward’s partisan-ness and being so hypocritical makes him loose all credibility. This criticism has no value. It is evident that these opinion pieces (much like my comment) are like the proverbial cliche about opinions – we know how the saying goes. Duke Johnson visits a small Southern town, intent on burying his brother. After the funeral, he learns that he must stay for 60 days, for the estate to be processed. A few locals convince Duke to reopen his late brother’s nightclub, and soon the local redneck policemen are intimidating Duke with threats of violence. Duke refuses to pay the bribes they demand, so then he and his lady friend Aretha are threatened and attacked by the crooked cops. Rather than take them on himself, Duke calls on his old pal Roy. Roy brings a few buddies to Bucktown, and they bring justice to the small town. With the redneck cops out of the way, Duke lets his guard down. Then the situation gets out of hand again when his ‘pals’ start to do what the rednecks were doing. Finally, Duke must settle the score himself – a situation he created!! YES IT WAS A LONG READ BUT BERMUDA HAS A FEW PARALLELS THAT HAVE BEEN REMONSTRATED AGAIN AND AGAIN. It would appear that all political entities are in some way self serving, full of malfeasance and a lack of accountability on all levels. The Auditor General in fact allows for the transition of an apparent situation into that of evident wrongdoing and what Mr. Hayward is writing may be true but he doesn’t beat hs drum all the time (only when it suits his cause or what he purports as being for “the people”. He is an unfortunate pawn that has promoted to rook – only aby to make long-sweeping lateral movements that rarely make a difference while the bishops, kings and queens rule the roost. typical political chess game – he is the face that the public will listen to and judging by the way the (b.p.su. )union runs its ship, there will continue to be this drivel that comes out of the talking heads with little to no effective action. sort of like a cap gun – makes a loud bang but just gives you a headache; no permanent damage! Actually, I think this was a very good article by Mr. Hayward.